Embroidered make-up bags. Featuring a fun multi color circle pattern on a white background with fuchsia trim. 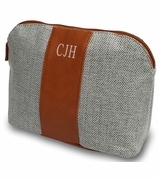 This micro-fiber cosmetic bag has two matching companion pieces available for purchase. Search WB-M160SORBET for the summer beach tote bag and WB-M1000SORBET for the rectangle beach towel. Add a few bath and body essentials and make this a birthday or hostess gift, employee present. 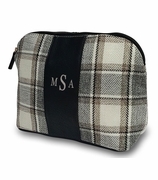 Embroidered make-up bag measures 11"W x 8.5"H x with and envelope bottom. Interior has PEVA lining, wristlet handle, outside zip pocket and zipper closure.